The latest climate extremes report finds that 9 out of 16 extreme weather events from last year were influenced by climate change. In particular, the conditions that led to New Zealand’s severe North Island drought — the worst for 41 years, estimated to have cost the economy NZ$1.3 billion — were made more likely by the effects of continued warming. Australia’s hottest ever year and run of record-breaking heatwaves also had humanity’s fingerprints all over it. 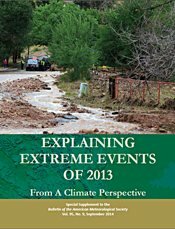 The new research — Explaining Extreme Events of 2013 from a Climate Perspective [pdf] — published as a special edition of the Bulletin of the American Meteorological Society, is the latest in a series of reports designed to look at weather extremes soon after they happen, and look for signs of the influence of climate change. The NZ paper, The role of anthropogenic climate change in the 2013 drought over North Island, New Zealand by Luke Harrington, Suzanne Rosier, Sam M. Dean, Stephen Stuart, and Alice Scahill (page s45 in the pdf), finds that a long term trend towards increasing summer high pressure systems over the North Island — seen in climate models as the system warms — has increased the risk of drought substantially. No fewer than 5 studies in the new report found clear links between Australia’s record-breaking 2013 heat and the influence of human-induced warming, as explained by The Conversation here. A summary of the report’s contents is available from NOAA, Climate Central has a very nice timeline, and The Guardian does it with pictures. Strangely, given the subject matter, only TV3 picked up on the NZ drought link (basing their story on a press release from the Green Party), while the NZ Herald chose to run an AFP story that led with the Aussie heatwaves and only mentioned the NZ drought in passing. Neither NIWA nor VUW chose to issue press releases about the study, despite its obvious newsworthiness and relevance to the NZ agricultural community.